It seems that I have a weakness towards head units that will look and act great inside a BMW E36. 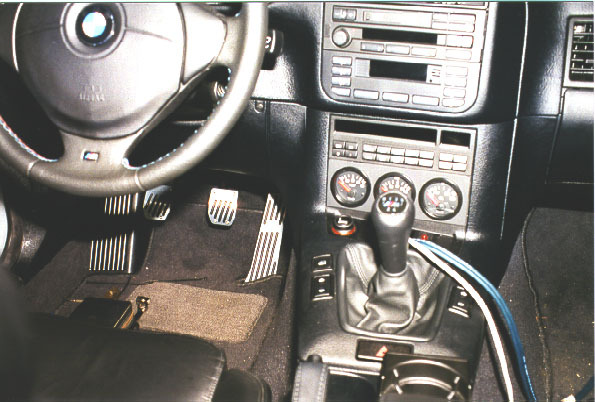 I’m sure that by now, every BMW E36 owner here knows that if you don’t like the original BMW head unit or you just need a little bit more options inside your head unit, that you will have to sacrifice the look of the car to get these options. In my "quest" to find the best head unit for the BMW E36, I wrote about the Bluetooth Ready Headunits For Your BMW and the Bluetooth Ready Headunits For Your BMW . . . Revisited! which were very good choices indeed. The problem with all these great head units was that they will not fit into your dashboard 100%. It will always look a little bit different than its surroundings. Now for the best part. This head unit can be set to illuminate amber which will match your BMW dash 100%. I saw a picture of this head unit with the Amber color somewhere, but now, I can’t find it. Sorry about this guys, if you saw that periactin online, buy lioresal. photo, you would know what I’m talking about. 1. Small Space: So, I don’t have to cut through metal anymore and I don’t need to put it in my trunk either. I will just put it on the rear seat which I don’t use that often. 2. 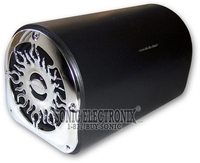 Integrated 120Watts Amplifier: Cool! 3. Nice looking box: OK, I hate the chrome a little bit, but what can I say, life is not perfect! Subwoofer, 120W Amplifier, Bass Control Knob, RCA Inputs. Everything you need to install them! I think this choice is awesome! 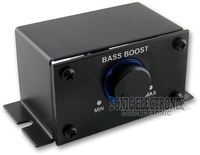 You upgrade your audio system with bass and without the headache. I periactin for sale, generic dapoxetine. hope you like it, I think it’s brilliant. 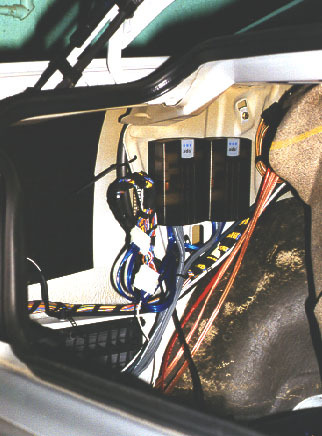 As I promised you, I’m writing today about how I upgraded my BMW E36 sound system without doing any damages to my car. I was not happy with the standard sound in my car as I kept recalling the sound system that I used to have in my previous BMW E30. It was a sound system with (Kenwood speakers, Subwoofers, Boschmann amplifier and a Sony Xplod headset with a CD changer). 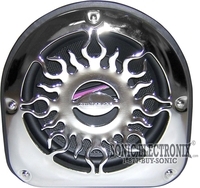 So, I wanted to do a similar change to my new car, but I didn’t want to make any damages to the car as I had to cut through the metal to place the speakers and the subwoofers in my old car. I found a new way which I think it’s away better than the old one and I’m going to explain it with photos next . So enjoy and I hope you’ll find this article very interesting. With that said, we can start now. . .
Now, you have to remove the speakers cover, like screenshots above. This will give you the ability to stick the rounded area of the speaker which holds the small speakers (Tweeters) in the whole of the original speakers. After that, you’ll have to use the drill to make two small wholes (or four) from the trunk side for each speaker to hold it using screws. This was a little bit hard for me because there’s no much space in the trunk to do it, but after some hard tries/fails, I successfully did it. So, now we have the speakers placed in the trunk and without cutting anything in the car steel. After that, you should put the rear covers back in the same way your removed them (from the car room side) and everything will be done. In the next few days, I will be writing about connecting the new CD headset. I’m putting these photos for the headset after it’s installed for you to see. So what do you think? I’ve tried the new sound and it’s so cool. Of course, there’s more to do to get a very good sound, but the budget is out now, so I will have to wait before proceeding with this. I’m done for today, see you soon guys. Wait for more on … BMW E36 Blog. Disclaimer: Use it at your own risk pal!! OK now I’m ready so here we go 3 . . . 2 . . . 1 . . When my father ordered his ’98 E38 740i, he opted for the $2200 “premium package.” When the car arrived and I was able to test out the system, it was very disappointing. My Oldsmobile had more bass!!! Well, that’s his car and he can do whatever he wants to it. When it was time to order my ’99 E36 M3, I knew not to opt for the Harmon/Kardon option. The $900 I saved would go towards my aftermarket system. a/d/s/ 335is.2 front separates. I consider these speakers top of the line. 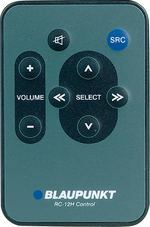 Only the PX series is higher but at a significant price premium. Also, the PX series only comes in a 6″ diameter so it wouldn’t fit the kick panel locations without some modifications. Also, keep in mind these are the newly released revision 2 series. 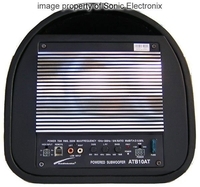 a/d/s/ P840.2 8-channel amplifier. a/d/s/ is well-known for the clear and accurate response. JL Audio stealthboxes in the rear. These fit the ’93-’96 E36 sedan and the ’93-’99 E36 coupe. I wanted to keep the trunk as stock looking as possible and I didn’t want to lose a lot of space to a sub-woofer enclosure. The stealthboxes are 8″ subs. They won’t pack the punch of a 10″ or 12″, but I think I’ll be happy with the 8 inchers.. This writeup will follow the flow of how I did it in real life. 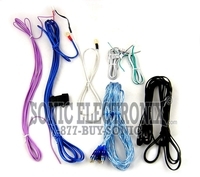 If you’re using the stock wires, the project can be partitioned into two sub-projects: 1) replacing the front woofers and tweeters and 2) mounting and installing the amp and running wires (optional). 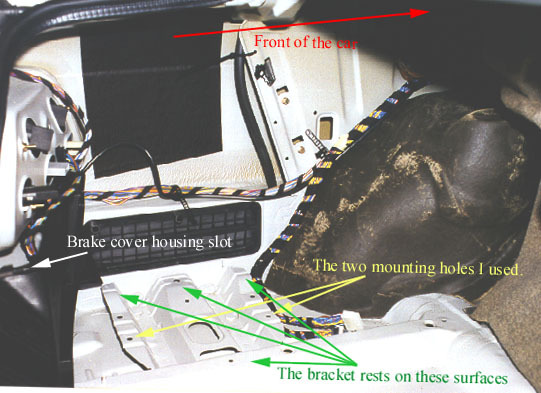 Remove the driver’s side kick panel. First, you need to remove the hood latchA?A?A?a philips screw driver will do. There is also a plastic anchor of sorts. A slotted screw driver will do here. Next, slide the lip of the kick panel from under the strip that says M3 in my case (I know, real technical words). Now slide the kick panel forward. Undo the four bolts holding the factory speaker. I had to solder a new spade connector onto the negative lead because the factory one was too small. Place the gasket seal on the back of the speaker to ensure an airtight seal. Screw the speaker back into place. 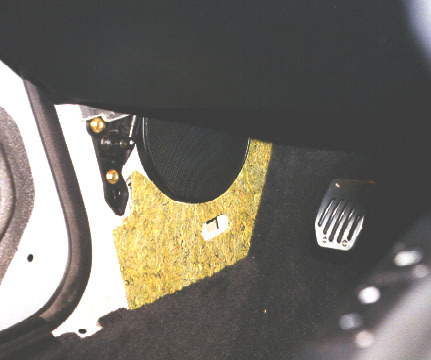 The green cardboard type insulation material had to be cut in order for the new speaker to fit. Heck, I forgot to put it back in on the passenger side. Hahaha. Removal of the passenger side is pretty much the same. To remove the tweeters, you have to pull the door panel off. To do this, use a butter knife to remove the two plastic covers behind the door pull. 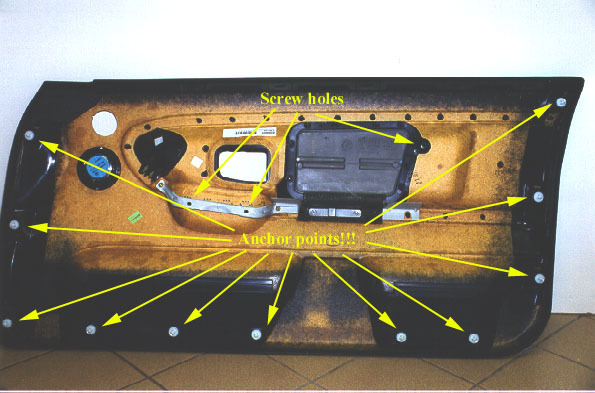 Also, remove the little black plastic cover that says, “Airbag.” There are torx screws behind there. 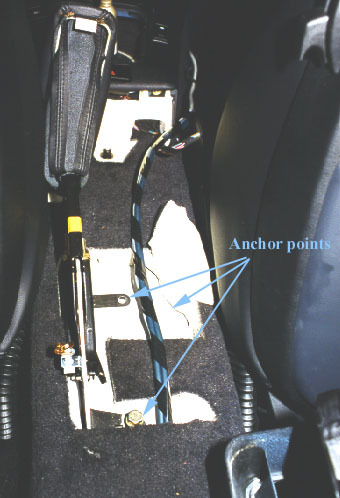 For the drivers, side, use a screw driver to push the door latch to fool the system into thinking the door is closed. Cut a butter knife at the lower edge of the door and twist. The whole door panel should pop off. Once one body clip comes off, they all seem to pop off! 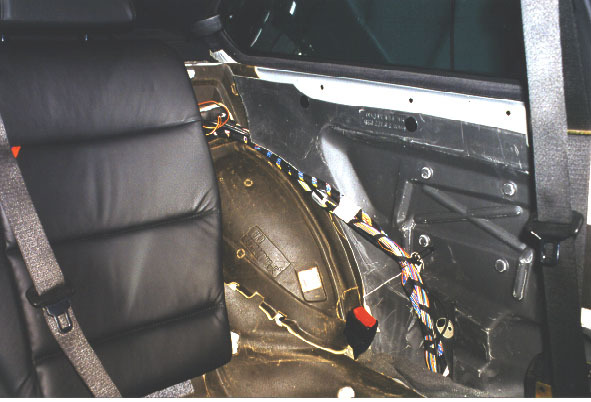 Be careful with the driver’s door panel because there’s still a connection to the mirror controls. The tweeter is held in place with a lockring. Twist it off and pop out the factory one. You’ll need to use a dremel and remove the plastic obstruction. Be careful not to go through the grill. Once that’s off, you can use silicone sealant to hold the new tweeters in place. 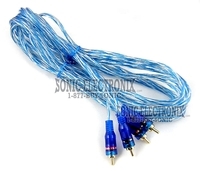 DonA?A?A?t forget to get your molex 2-conductor connector. I ended up using the cheesy radio shack versionsA?A?A?not as elegant. Suspend it from the rear deck shelf. Or come up with something clever. I’m a masochist and opted for the third option. The idea of shooting holes into my sheet metal didn’t sit well with me. 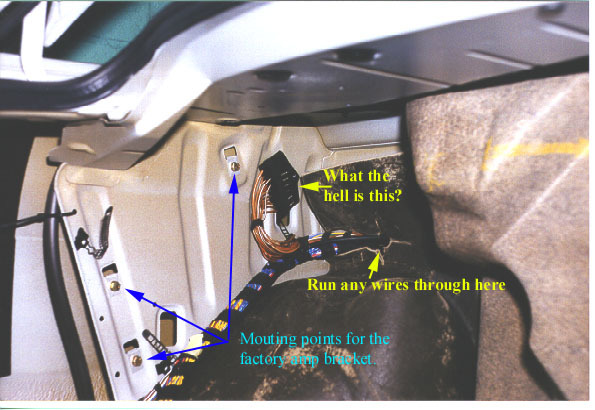 Mounting the amp to the back seat was plausible, but not only are the seats curvy, where will you run all the ugly wires? First, you need to remove the left rear brake light cover housing by turning the retaining screw counterclockwise and pulling up and out. Next, you need to remove the left rear speaker. To remove the grill, push your thumbs against the front edge. Once you bend the grill sufficiently, you can push upwards. Next, remove the two screws holding the speakers in place. There should be (at least on mine) a metal clip holding the whole unit in place. Push this tab and the speaker will drop out. Now you can work the molded carpet on the side of the trunk outwards. You will now see the factory amp. It’s held in place by three 10mm bolts. I looked around and removed the black plastic trim left to the spare tire by removing the plastic nuts. I found what I though to be a perfect location. There were already holes in the sheet metal for me to secure a bracket to. I pestered my uncle for some 3/4″ plywood stock–we are talking about a 15 pound metal object subjected to the extreme cornering forces of my M3–and fabricated a sturdy bracket. I used 2″ 1/4″ bolts with washers to secure the bracket in place. If you look, you’ll see the area with the holes is lower than the rest points. I used a piece of scrap 3/4″ plywood to make a shim. It works perfectly. I cut the factory amp connectors off. I ended up following Bob Hazelwood’s advice and ordered two (you’ll probably need threeA?A?A?so I’m short a connector) 14-conductor mini-fit molex connectors from http://www.digikey.com. Definitely order the crimp tool while you’re at it. It makes life so much easier and the crimps look real nice. After running wires and soldering everything (oh, solder all crimp connections just in case! 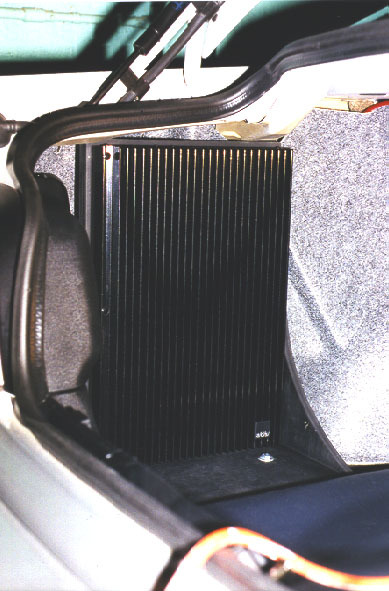 ), roll back the carpet, place the brake light cover back, and install the amp bracket and amp. I had to cut 1/2″ off the bottom of the molded carpet (a new one costs $45) so the bracket would fit easily. I was planning on lifting it and squishing the bracket underneath, but after all the wires were in place, there was really no room. I decided to run a 4-conductor wire for my radar detector, 8-conductor wire for the bass control, and a patch cable for the new head unit. Time to run wires. First, remove the rear seat. This is accomplished by hovering over the seat as if you’re about to sit on it. Grab right underneath the lip of the leather and pull up. 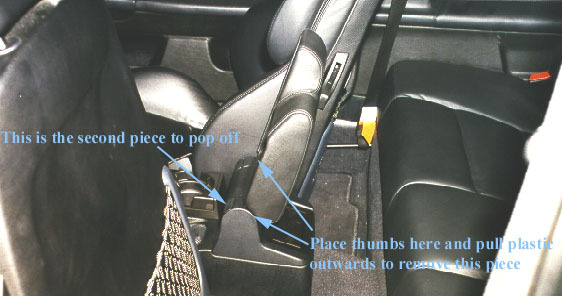 Next, remove the side bolster next to the fold-down seat. The latch is on the top of the bolster. I guess you could simply grab and yank. I wedged my fingers at the bottom between the bolster and the side panel and ran my fingers upwards. Once there, I was able to get leverage to pop the clip off. 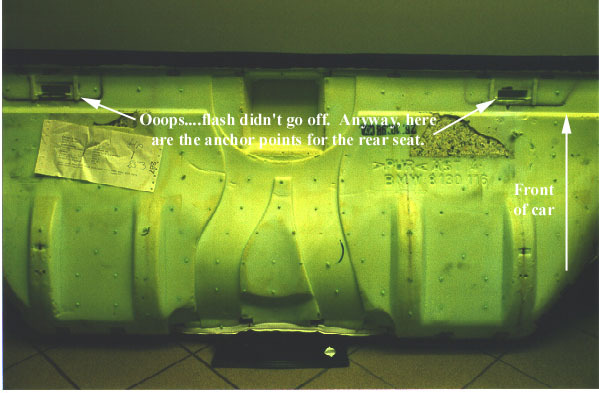 The remaining anchor point is on the bottom where the seat hinges. Simply push in with your finger and the side bolster will come off. Next, remove the side panel. The body clips are located at the top. I put my hand at the rear and pulled. PopA?A?A?came right off. 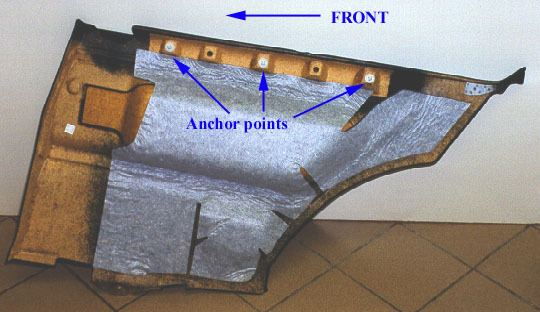 See the picture for the anchor points. Pop the hazard light out using a butter knife covered with a cloth. It’s easiest to pop out at the left side. There will be a screw there holding down the front of the center piece. Once that’s removed, the center piece will be loose. You can run wires now or if you’re like me, you can actually remove everything. The armrest bracket is fastened to the chassis using three 13mm bolts. 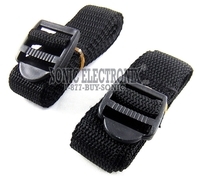 You’ll need a swivel/universal socket to remove the front two. A box wrench will remove the rear bolt. Put everything back. You feel better now, right? There it isA?A?A?a complete audio overhaul. More pictures to come when the stealthboxes arrive. Sorry for the graphics intensive page.